A simple healthy homemade granola made with coconut, oats, chia seeds, and maple syrup. This Coconut Chia Granola is filled with plant-based nutrients and is vegan and gluten-free. How I love granola. It is such a versatile thing to have on hand. Granola provides crunch to creamy dishes such as yogurt, makes a great topping for a fruit crisp, or is a wonderful addition to cereal–both cold and warm varieties. I love a touch of granola sprinkled on top of oatmeal. Granola is one of those things that’s hard to buy. It’s either filled with added sugars, sodium, and preservatives, or it costs an arm and a leg. However, making granola at home is not only easy but super economical. It can also be customized to fit what your preference and what you have in the pantry. By making it at home, you can control what you put into it and make it for pennies. What Makes This Granola Healthy? Oats: A whole grain rich in fiber and is known to help lower blood pressure. Be sure to check out all my Oats Recipes. Maple Syrup: Lower glycemic index and rich in calcium, magnesium, and iron. Making granola at home could not be any simpler. Mix ingredients together for granola. Spread out on large sheet pan. Bake until toasted and golden. You can add dried fruits to this homemade granola AFTER granola has toasted in the oven. Coconut oil gives this granola it’s signature taste, but feel free to replace with a neutral oil like canola. Feel free to leave out coconut or chia seeds in this granola recipe. 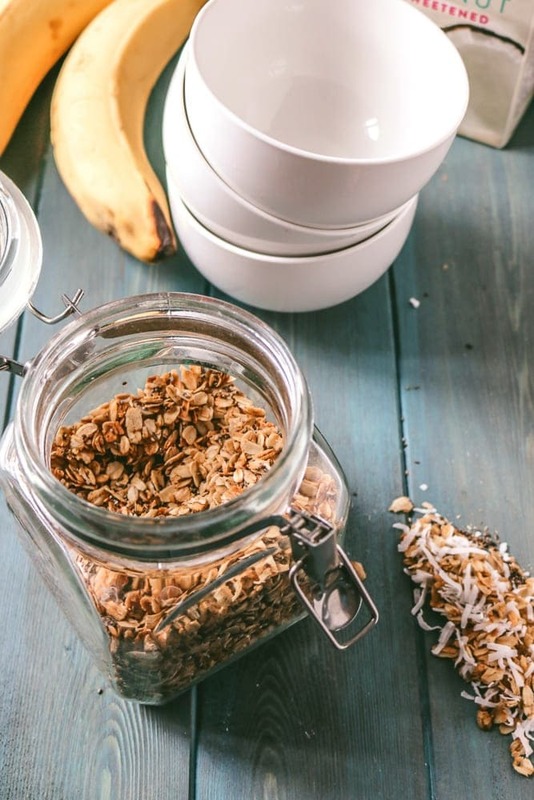 A homemade granola recipe made with shredded coconut, chia and oats. Mix together oats, chia seeds, coconut, cinnamon and salt until well combined. Add in coconut oil and maple syrup and toss until the dry mixtures is coated with syrup and oil. Spread out onto large cooking sheet and bake for 40 minutes, stirring every 10 minutes. Kristen, I so love your idea of “healthy eating” and whole hardheartedly agree with it! Your delicious blend of chia, maple syrup, coconut, cinnamon and oats is making me wish I was having a bowl of yogurt and granola for breakfast! How funny we just bought a container of this combo milk. It is so good in coffee! Nothing beats a big bowl of crunch in the morning! I’ve never seen a coconut almond blend before! I’ll have to be on the look out! Cynthia–it is a newer flavor combo and my new FAVORITE!!! You have to try it! I love making homemade granola — this sounds like a wonder flavor combo! This flavor is so good–enjoy! I hope you love it just as much as us! Look delish! I like that it’s not too sweet like the stuff from the store. For the chia seeds, does the colour matter whether they’re white or black or whatever? Hi Cindy! Chia seeds can be either color 🙂 Enjoy! 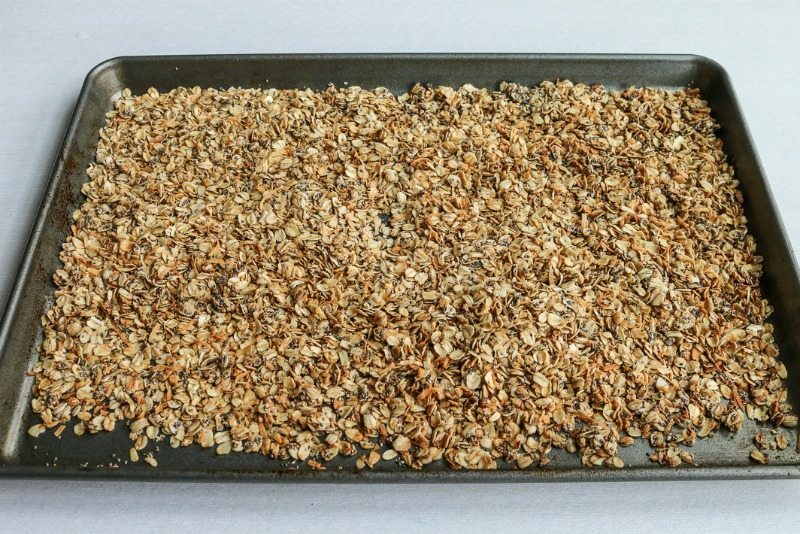 I love this easy granola recipe! The coconut, maple syrup, and cinnamon combination is so good! This makes a great make ahead breakfast. Thank you so much Amanda! I love the combination of flavors myself. I just made this. Wow, it’s alot better than any I’ve ever tasted!!! Thank you for this recipe!! Absolutely LOVE it!!! I absolutely love hearing this. Thank you for sharing Barbara.